Around Lake Worth, you can find a plethora of pool companies that can assist you with any and all of your swimming pool needs. With the warm weather that Florida has to offer, owning and maintaining an immaculate pool is a welcomed privilege in the area. There is nothing like enjoying your own swimming pool on a hot, sultry afternoon. If you are looking for someone to install a pool, or if you already have a pool and need help with repair or maintenance, then a quick search online will offer you several Lake Worth pool companies from which to choose. 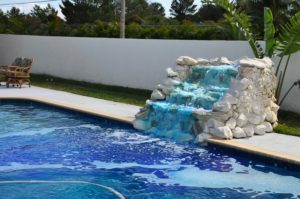 Installation services are offered by many, and is an important decision that requires some research, on your part, if you seek professional work and quality results contact us at Barefoot Pools. If you already own a pool, and are seeking assistance with repair or maintenance, Online reviews can shed some light on a company’s quality and reputation, as well as services offered and pricing we’ve definitely got the reviews to prove our work. Many homeowners enjoy having a regular maintenance plan with a local pool company, because then they have the freedom to enjoy their own pool whenever they wish, without the constant worry of cleaning and maintaining the pool area, as well as the chemicals in the water. Many plans include routine visits, usually on a weekly basis, to clean the surface and bottom of the pool, and also a chemical test to ensure proper balance of the water. Since so many homes, and residential buildings, have swimming pools, the supply and demand ratio of pools versus pool companies is pretty balanced within the Lake Worth region. Whether you are seeking an appointment to have your pool built, or if you are in need of services with an existing pool, call us at Barefoot Pools we do it right the first time! A cool, refreshing pool is a welcome sight for people of all ages, especially on a hot, sunny day. It is even more welcoming, if the pool is clean and well taken care of. Contact Barefoot Pools and be on your way to a perfect swimming pool environment from the best company among the Lake Worth pool companies.